I can’t believe this myth still needs dispelling. “Radio stations, research and focus groups have done many studies on this subject and the result is the same and has been the same for years. The result has been that most women don’t like to listen to other women on the air. Let Me Explain This Yet Again. It is very unlikely that the anonymous person quoted above has ever seen any such “research.” More likely, he is parroting what he has been told by others…who in turn are repeating what they were told. If that person did see the “research,” then he simply is incapable of separating Research from Garbage. Oh, I see. Most radio stations have large numbers of listeners who spend eight solid hours with one radio station. And they complain when they hear two female hosts. Sure they do. You can’t talk about politics on the radio, because you’re a woman. You can’t be sarcastic on the radio, because you’re a woman. You can’t talk about sports on the radio, because you’re a woman. You can’t be funny on the radio, because you’re a woman. And how does the PD or GM know this? Oh, really? May I see that research? To Our Male Readers: Think about being unemployed. Think about all the non-returned phone calls and ignored airchecks and resumes and the frustrations of looking for work. But what about this legendary “research”? The focus group participants search their memory databases for instances of strong female hosts…and they come up blank. They did not grow up listening to a funny, entertaining, outrageous, provocative woman jock because from the beginning of radio until today precious few women have been given the chance to develop as strong personalities. Instead, to those focus group members, “female disc jockey” means Morning Sidechick (who giggles at the funny stuff “the boys” do) or Mid-Day Jock (“Another 17 in a row….”). If I ask you, “Do you think you’d enjoy tuna fish-flavored ice cream?” you will search your own experiences, looking for a point of reference. But you’ve never tasted anything at all like tuna-flavored ice cream. So even if you like both tuna and ice cream, there’s a good chance you’ll vote “thumbs down” on this proposed marriage between Starkist and Ben & Jerry’s. People Cannot Accurately Predict Their Reactions To Stimuli That Are Outside Their Frames Of Reference. In 1989, few boxing fans thought Mike Tyson could be beaten in the ring. In 1990, many fans were sure he could be beaten. What made the difference? A guy named Buster Douglas, who convincingly knocked out Tyson in Tokyo. Before Douglas came along, no one had ever seen Tyson lose. So they couldn’t imagine it. But once the image of a more mortal Mike Tyson entered the collective consciousness, people’s perceptions of “reality” changed. FACT: Radio listeners will listen to people who entertain or otherwise engage them. Regardless of their gender, age, or race. FACT: Darn few audience members listen to one station for two complete, consecutive air shifts. And those few exceptions do not call radio stations to complain when they hear two women in a row. FACT: Radio is a tough enough business to survive in without having to put up with such ignorant bigotry. And that’s what it is: bigotry. The mindless embracing and spreading of unfounded, false generalizations about specific groups of people. Okay, maybe bigotry and ignorance are good things. Maybe women deserve to be treated as second-class citizens. And when you commit to such bad radio because of “research,” you are making programming decisions that are based upon incompetent research. Here’s a jock whose airchecks I’ve played in radio seminars around the world. Oddly, every time I play her stuff, many (not necessarily all) of the attendees love it. Even though the jock is — gasp — a woman! Forget that I work in radio. 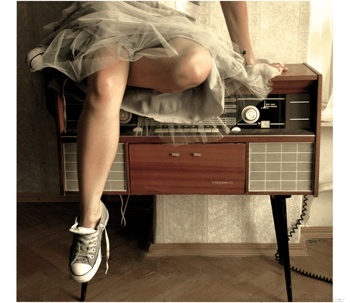 As a radio listener, I want to hear more women personalities on the air! Always have and always will. I never believed any of that research over the decades and hated that a PD, OM or GM had to make a quota and felt forced to hire only one woman for the air staff. Totally insane. I can’t speak of all scenarios around the country but at every station that I worked at, it was usually the female personality that did most of the work (production and remotes). oh Dan, if I could reach you, I’d hug you. After 25 years in the biz, I have heard ’em ALL on your list. As far as that “research” goes…. You could have women on all day long—if they are great, entertaining and engaging on-air talent–they would be loved and listened too with ferocity. A great talent is a great talent no matter the gender. …..let me add to my above comment. A great talent is a great talent no matter the gender…yes…but management has to ALLOW their talent be GREAT talent on the air. Most females on-air are saddled with the same jobs– news/traffic girl, giggle box to the guys, etc. Most of us are rather multi-dimensional! And that is a VERY good thing for on air, but you have to allow us to go there. Now … how about some advice for a woman who encounters this arcane attitude every day? A PD at a rock station I interviewed for the other day told me that I could only do rock radio if I became ‘less womanly.’ Otherwise, I can only do AC. What in the name of God do I say to that? I remember one PD in Stockton wanted to hire me “Because of that stupid law that says we have to have a chick on the air. @ Lynda: as a former PD in Stockton, I’m sure I know the person in question (it wasn’t me! lol). I can’t tell you how many people over the years believed that you had to replace a woman with a woman, by law. Nonsense! Hire the best personality for the job, period. That being said, I have personally witnessed women who would change the station when female jocks came on. It may be rare, but it does happen. THANK YOU!!!!!!!! So Pleased you posted this, I just wish more people thought the same way, I work in a Market where I am the only Woman, wish the PD’s here would read that. We doubt that there’s many, if any, stations that can boast an all female announcing staff for Breakfast, Morning and Afternoon. At least until regular breakfast host Steve Murphy gets back from holidays, no male voices will be heard on Power 100.3 FM Murray Bridge, S.A. until Drive with Hamish and Andy. Even after Steve returns and bumps his fill-in Maria Foundas back to weekends, Mel Dee will continue on mornings while Sarah Demicoli presents afternoons. Mel, who is also the Power Program Director says, “From my understanding it’s pretty unusual to find a solo female doing breakfast as it is, without following on with a female on mornings then another doing afternoons. “The funny thing is we seem to be getting a lot more callers. Are females more relatable?” says Mel. There may be talk of a shortage of talented female announcers in the radio industry, but Power FM in Murray Bridge are proving that it’s certainly not the case in South Australia. So there world! Australian radio can be progressive! Good post, Dan and thanks! As the very 1st female MD then PD and OP’s Manager in the 18th market..I can relate! My career began in ’72 at 14! Two years later..MD and one of three female jocks on the air in the NYC/L.I. markets. While there were obstacles with lots of shattered glass :*)..I considered myself just “one of the guys” and went about my business. However..(not too long ago) I did find discrimination was alive and well when a job for PD came up and was given to a male with NO prior programming experience. I had almost two decades worth. I like it!!! Actually, I am out of radio now, but when I was on the air, my wife (the LSM with on air background) would sit in on certain benchmarks on the morning show. I would have loved for her to be on full time and judging from listener feedback (phone and email. . .lots of email) they would have loved it too. She brought a piece to the puzzle that I could not. We do voice overs and production and hey, she is much more in demand than I. . . Girl Power, baby. . .can I say that. . .ok, now I feel strange. . .
A radio station recently in OZ had a complete on-air team made entirely of females. It was very refreshing to hear, that’s for sure! As OM of a station with a chick in the middays (me) and another chick on PM drive, I can tell you that we have gotten nothing but positive reaction from our listeners & advertisers. We refuse to believe that a woman is “window dressing,” “an EEO token,” “a sidechick,” or any other way someone wants to word “worthless.” And women in the business should stop buying into what non-existing “research” says. Go for the gig! Make it better – the way only you can. Work on your personality and your delivery and don’t buy into the glass ceiling philosophy in radio.! Right on, Dan. One of the best jocks I ever heard was our mutal friend, C.J. Bronson. She worked at KNBR, the NBC O & O in San Francisco for 13 years. They kept moving her around into different shifts, replacing her by a male announcer. Almost every time they did this her replacement’s ratings dropped. There’s some research for you. @Dave: I absolutely agree re: CJ. For years and years I’ve been trying to get her to send me some of her old air checks. For years and years she said no. Leave it to Dan O’Day to remind us of the things that are important and to point out our failings. And we do fail when we quote that “research,” and do those other unthinkable things! @Terressa: That woman took the time to email a complete stranger (you) to say she thinks your voice has a “strange intonation” and is “boring” and she doesn’t listen to you. Doesn’t that tell you something about that person? When normal people don’t like a voice on the radio, they simply don’t listen. They don’t take the time to tell the voice on the radio they’re not listening. 2. You are correct: Of course you can’t please everyone. You cannot afford to be disheartened by the occasional person who doesn’t like you. I came here because I saw someone post something about CJ Bronson. I loved her on KNBR. I always will. She had a voice and style about her that I’ll never forget. Next post: Why And Why Not?